FJ Cruiser Pet and Cargo Barrier. Please don't confuse this with all the "universal" pet barriers out there. No longer will you have to struggle to get the barrier installed. Gone are the zip-ties and the make shift rigging to keep that “universal” barrier upright! We have built a STURDY and well-engineered barrier specifically for your FJCruiser. With this 2nd generation model....we decided to keep the positive attributes and pretty much toss the rest to the wayside. 1) The dimensions are the same. 2) The mounting system is the same....same easy installation. 3) The weight is roughly the same. 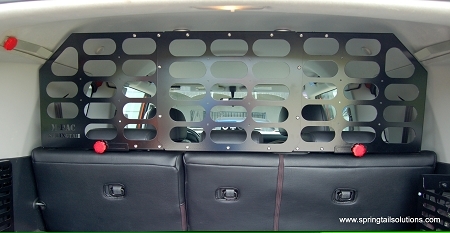 b) Center panel can be removed for larger access hole or can be replaced with a clear panel for even better visibility. c) Can be disassembled to store in less space. 3) It requires a bit more assembly....if you can use a socket set, you are good. 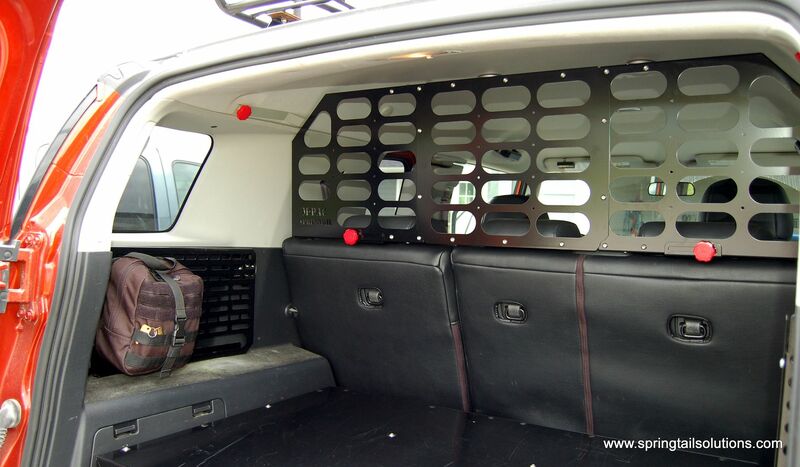 It will serve to help contain loose items in the cargo area while going over rough terrain and can significantly increase your cargo capacity since items will no longer "flow" over the back seat. 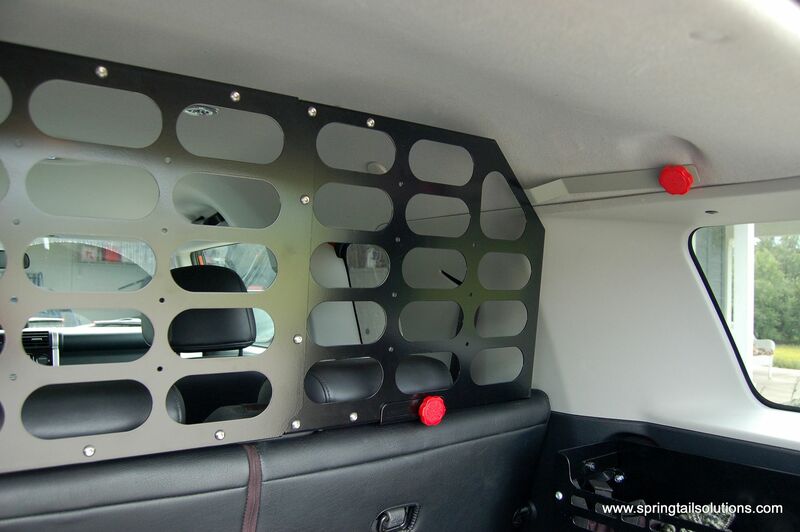 In addition to keeping your stuff in the cargo area, we have designed it to accept either an MPAC rack or quickfist mounts. This allows you to place anything from rifles and axes to smaller items in MOLLE pouches. Pet owners will appreciate its ability to keep the animals in back providing a safer environment for both the pet and the occupants. Also, the upper headrests are designed to push up on the headliner a bit to decrease any chance of rattling. 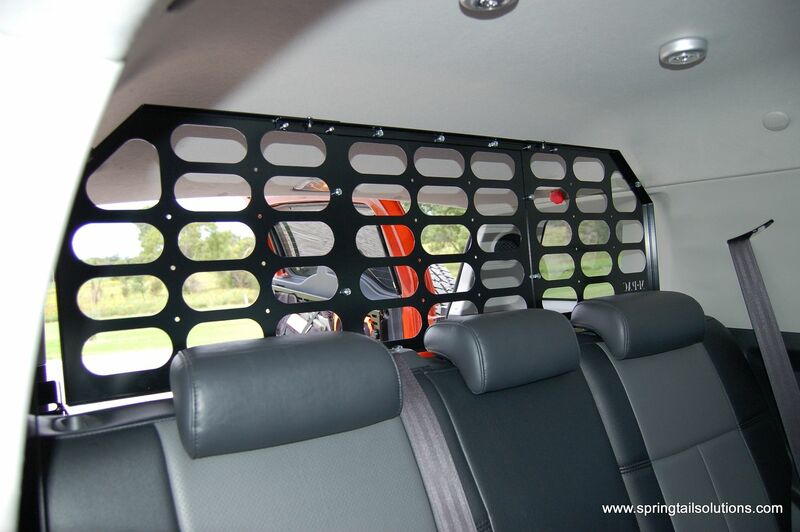 This product was designed to help contain objects and pets in the cargo area during off-road activities. It will limit rearward vision, please drive with accordingly and with caution. For vehicles not equipped with an inside door release, there is a potential for entrapment since access is blocked to the front of the vehicle. Please familiarize yourself and all occupants of the vehicle to the RED quick-detach knobs to facilitate leaving the cargo area in such an event. Do not replace quick detach hardware with regular hardware. Never leave children unattended around an open vehicle cargo bay as entrapment could cause death or permanent disability. By installing this Springtail product your acknowledging these potential risks. If you do not accept these conditions, please return unused product to Springtail for a prompt refund. This thing is a solid piece of hardware. Looked for pet barriers for my FJ and most of them were netting or I could have gone with a cheap universal one. I have a Shepherd that has chewed through netting and definitely not doing that. Why go cheap when the whole point is to keep everything secure in the back. This barrier is almost as sturdy as the barrier in my squad and will more than keep everything in the back and it is super easy to install. As far as impairing your vision, it does a little bit, but not to the point that you absolutely cannot see. Great, quality products that I would strongly recommend. Between the customer service and the quality of the products, well worth the five stars and I look forward to picking up some of the MOLLE mounting hardware. This is great! So easy to install, took 5 to 10 mins tops. When it showed up and I took it out of the box. I looked at it and I had a big smile on my face. This is 100% what I was looking for. Also I've had it a few months now and been out on many mountain roads here in B.C. with my dogs in the back. It is as solid as the day I put it in. The cost of this is nothing once you have it installed in your FJ. Well worth the money. Installed easily with no modifications to either the product or my rig. Easy to remove if needed. And the best parts, no rattles and no indenting my headliner! Oh yeah, the dog couldn't defeat it either -- took one look and didn't even try. Fantastic product!! Fits perfectly, with no rattles, even with an axe, shovel, and pew pew mounted on it. Added bonus is my dogs REALLY live riding in my FJ, and I don't have to worry about the interior! Highly recommend!